Obsessed with finding the right fabric? I am too, and this was no exception for the fabrics I used in my book Switch Craft. Each material was meticulously chosen for its color, pattern, sheen, and weave, while bringing vibrancy to the normally dull subject of electronics. I have put together a guide to help you get the best fabric for your next Switch Craft project. For the Cushion Brite and Dancing Queen Skirt, I used large prints that would complement the brightness of EL wire, but not overwhelm the eye. To find this type of print you'll need to go outside of your normal neighborhood fabric and quilting store to places like Marimekko and Ikea Textiles. 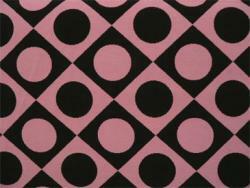 The Marimekko print for the Dancing Queen Skirt is called "La Boca." It comes in blue and brown. The white seems to be discontinued. Marimekko fabrics are sold in stores around the USA or online. You can do a search for the store nearest you at the Marimekko site here, or find prints online at Textileart.com or Reprodepot.com. The orange leaf pattern on Cushion Brite from Ikea is lightweight and sturdy. I find that the lightness of Ikea fabrics make them much easier to manipulate than a regular heavy upholstry fabric. Unfortunately, like the white Marimekko fabric, Ikea doesn’t carry the exact fabric anymore. 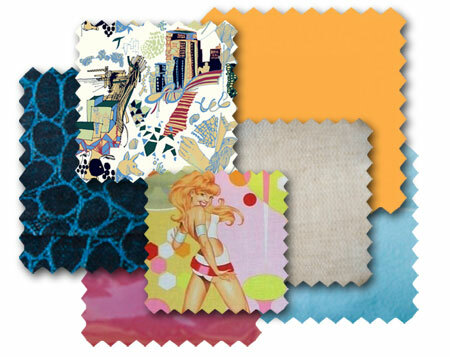 Not to worry, you can get the same bold effect with the INGER or GUNVOR fabric collections as seen below. The Urban Blaster and Galaxy Carrier have two popular fabrics relatively easy to find. Both fabrics are by Alexander Henry. The Urban Blaster uses “Inked Tattoo” and the Galaxy Carrier uses “Futurella Fabric: Pink.” Both were purchased online at J and O fabrics. If they are sold out, you can try Pink Chalk Fabrics as a second option. The main body of the Galaxy carrier is made from a thin vinyl with soft felt backing, and the top handle is linen with a coating that gives it a very subtle sheen. Both are from B&J fabrics in NYC - one of my personal favorites. 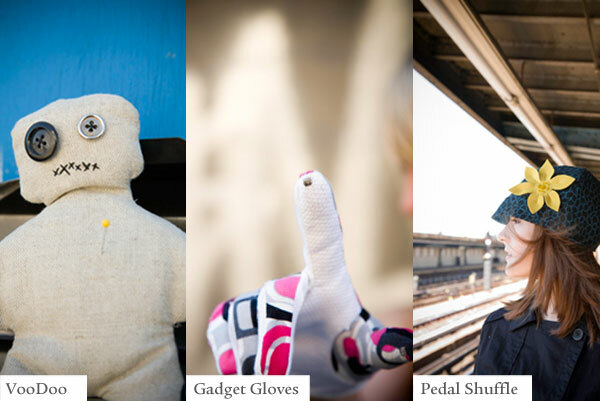 The Gadget Gloves, VooDooDoll, and Petal Shuffle are made from scrap fabrics that I collected over the years fabric searching. The gloves are inspired by the fashions of 1950-60’s Vespa posters, when pink was all the rage. Best fabric options today are hounds-tooth or a real or faux Coach pattern. 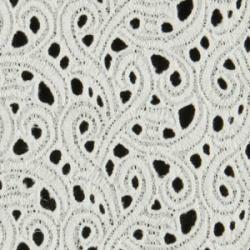 If you want to be totally retro, try a white eyelet fabric - very chic! The VooDooDoll is best made from a tightly woven burlap or linen. Try out a fabric with a large black print so your VooDoo looks like he has tattoos. Or take a complete departure from the scrappy look and make him out of white canvas, while painting or drawing a face right onto the design - a great idea for young kids. Shiny Clutch is a favorite project. Made from white perforated leather and faux snake skin for the handle. The fabric was purchased from a local distributor called Leather Impact in New York. You can also do a search to find a faux leather provider in your area or on Ebay. If you are purchasing real leather or animal skin, make sure the pelt size is wide enough and long enough for your pattern, (which is approximately 12” x 24"). As always, if you know of any great material resources, please leave a comment below and let us know. If you can think of another object (or objects) to perform the same functions, surely you may forgo the corrugated plastic sheet. For the Shiny Clutch are there other options that can be used other than the 5mm corrugated plastic sheet?